The economic impact of a huge $8 billion contract awarded to Vancouver shipbuilders last week could trickle all the way up the Fraser Valley to Chilliwack, according to the University of the Fraser Valley’s dean of trades and technology. Harv McCullough, who oversees UFV’s trades programs, says the effects of the contract will reverberate through the entire Lower Mainland, and beyond. “There’s going to be a huge rippling effect for all kinds of businesses,” said McCullough. The contract will directly create some 4,000 jobs over eight years in British Columbia, including 3,200 in North Vancouver. Many of those will be for ship fabricators and welders. 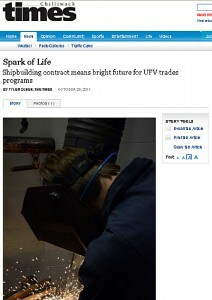 Each year, 80 students go through a 34-week welding courses at UFV’s Keith Wilson Road trades and technology campus. With a skilled labour shortage already forecast, McCullough said the contracts will only add to the demand for the university’s graduates-who learn both traditional welding skills and how to work with cutting edge technology including robotic welders. But with the university already turning away applicants for many of its trades programs, including its welding course, the question becomes whether government will contribute more funding to allow trade schools like UFV to offer more programs. “I’m not sure if this will have an impact in possibly freeing up some additional training spaces for a university like us, which is running at over capacity and probably going to have to address additional needs because of this large contract,” said McCullough. British Columbia, like most governments in Canada and around the world, is operating on a tight budget and UFV, like other government-dependent entities, has seen little new money in recent years. While he is uncertain of the future, McCullough anticipates that the new contract may lead to some targeted funding opportunities. The demand for programs-both from students and would-be employers-is also expected to increase as more and more baby boomers head for retirement. With that in mind, UFV’s trades program now offers a trades management stream for its business administration degree and has introduced a new graphic design diploma program. McCullough also explained that the university itself can adjust, in a limited way, to increasing demands for certain programs by cutting back in other, less in-demand areas. “There’s going to be a lot of reposturing and rethinking,” he said.